Where is the Vista Run Command? This page will explain how XP’s ‘Run’ command has been incorporated into Vista’s ‘Start Search’. As ever, keep your eye on Vista’s security, for example, ‘Run as administrator’. When I failed to find the Vista Run command, the fact that I was attempting this task on Friday the 13th, should have rung alarm bells. The root cause was Guy being a Luddite and trying do something the old way. What I should have done was simply use Vista’s new Start Search dialog box, in the same way I used the old ‘Run’ command in XP. All that you need is to type the name of the executable, e.g. 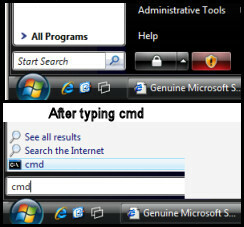 cmd, in the Start Search dialog box. See screenshots opposite. As you configure Vista so you will come to love the way that the new Start Search subtly combines the best of the old XP ‘Run box’, with the improved Vista Quick Search. What I particularly liked was the way the interface displayed all the matching programs as I typed just the first few letters. You will also find Quick Search (a sister of Start Search), in the new Windows Explorer. A case of learn a tool in one area and then apply that knowledge to another interface. If I really wanted to be a Luddite and display the obsolete Run command, the obvious solution, (in retrospect) was to click on the flashy new Start Button, Properties, Start Menu and Customize. Scroll down, until I found Run Command and ticked the box. My screen shot opposite is a thumbnail, and so enlarges if you double click. In truth, what I actually did was to go around the houses. What I did was find the cmd executable and drag it onto the Quick Launch bar. Then, one day, I remembered the old trick of pressing Windows Key and R, which launched the Run box, from there I typed CMD. Vista’s new behaviour of hiding the Run command is clearly ‘by design’. Perhaps future generations of ordinary users will not be aware of the existence of Run and CMD. Hiding the ‘Run’ command, seems like a pre-empt of Group Policies, since they usually prevent ordinary users seeing the Run box. Once I figured out the Vista Run command in general, and the CMD prompt in particular, I was able check the Vista IP settings. The first surprise was an IPv6 address, presumably assigned automatically by APIPA. Overall, the look and feel was much as before, however each new operating system brings additions to the Ipconfig data, for example in Vista, System Quarantine State. 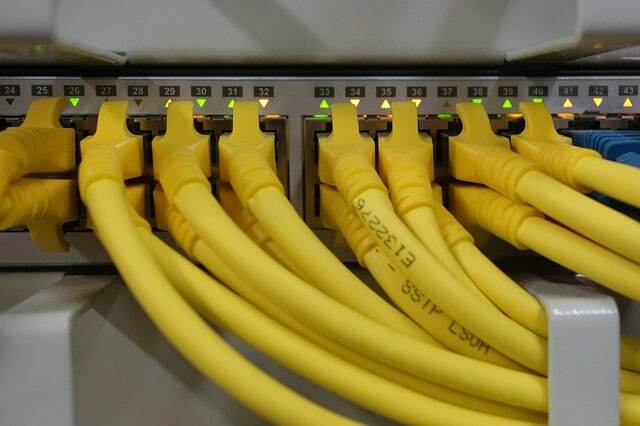 Ipconfig has one new switch, Ipconfig /allcompartments; I have found no killer use just yet, it seems very similar to Ipconfig /all – perhaps it’s me being a Luddite again! Trap: Instead of typing CMD, you launch the even older program: command.com. Symptoms include ‘Console Session’ error. Even if you turn off UAC (User Account Control) there are actions where you still need elevated rights. I had a problem with two of Ipconfig’s switches, /release and /renew each gave an error message: ‘The requested operation requires elevation’. Fortunately, the solution was easy; as you can see from the screen shot to the right, just right-click the Command Prompt and select ‘Run as administrator’ from the shortcut menu. As a result I was allowed to run ipconfig /release. There was no irritating: ‘The requested operation requires elevation’. As so often, Microsoft provide two way of performing a task. 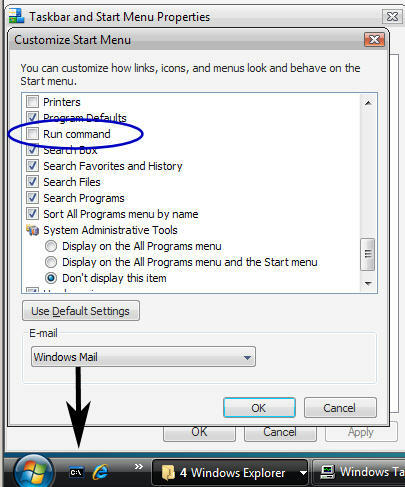 If you highlight cmd (the command prompt program), then press Ctrl Shift Enter, you also achieve, ‘Run as administrator’. Observe the word Administrator: in the title bar when ever you have these elevated rights. Once you understand that ‘Run as administrator’ invokes elevated privileges; then perhaps you can appreciate why, even if you are logged on as the Administrator, Vista still requires this extra security step. I have to say that many administrators cannot grasp this idea of elevated privileges, consequently they are in for a frustrating time with Vista’s security measures. However, you should know that Vista has a super-user account, here his how you activate the hidden administrator. If your true mission is open a cmd shell, then why not Pin CMD permanently to the Start Menu? Observe the screen shot to the above right, notice how a) The Command Prompt is selected b) Pin to Start Menu is available on the short cut menu. 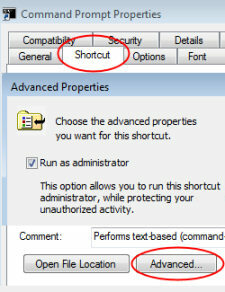 Now look for other shortcuts where you can tick the ‘Run as administrator’ box. Trap: ‘Run as administrator’ is not the same as the ‘Run as’ found in previous Windows programs. And Now For Something Different – Remove RunAs Administrator! Suppose that you don’t want users to see the ‘RunAs Administrator command. Well, there is a registry hack to remove this command from the short-cut menus. What you need to do is create a new DWORD called HideRunAsVerb, and set its value to 1. Now, create a new DWORD value called HideRunAsVerb and set its value to 1. HideRunAsVerb is a setting better suited to people like my old enemy Psycho, than normal responsible administrators. If you cannot get this to work its either because you are looking for an existing setting called, HideRunAsVerb, whereas you need to create it. Else, you created it in HKCU instead of HKEY_LOCAL_MACHINE. Abandon thoughts of the old ‘Run command’. Instead take the time to master the Start Search and Quick Search. The dialog box is intuitive, powerful and helps you spell the names of the program you wish to launch. If your mission is really to access the command prompt, then spend a minute configuring the CMD executable so that you can: ‘Run as administrator’.